It’s the biggest news to hit South Georgia! 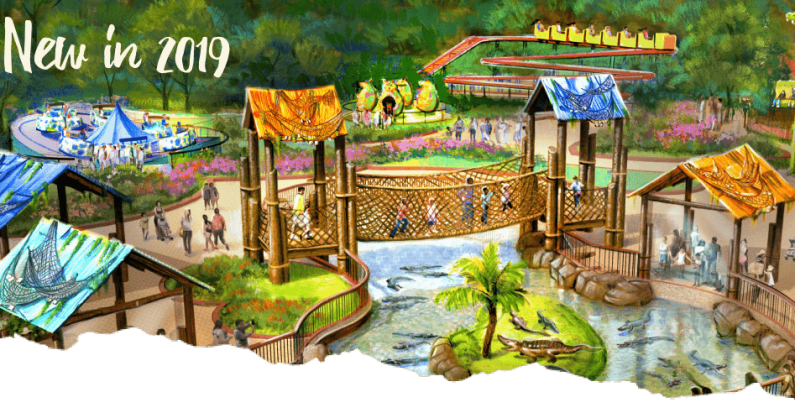 Wild Adventures introduces a new area filled with fun and exploration for children of all ages in 2019. The new area will feature 6 kid-friendly rides including Gator Crossing Rope Bridge. Dare to cross our new suspended rope bridge right above the gator pond, filled with dozens of alligators. After this heart-pumping action, take a whirl on the Flying Gators ride. You will love to spin and twirl on these fun-loving gators. Or, grab ahold and hop about on our Hoppin’ Gators. The giggles will never end on these and other exciting rides in our new area. After the wild rides, the adventure continues! Get up close and personal with our resident alligators of all ages. Visit Alligator Alley where you will can feed a gator plus learn about these and other reptiles and their habitats during keeper talks. While you explore, meet Mr. Twister, the granddaddy of all Wild Adventure’s gators. You will be on your way to becoming an expert explorer after spending time in our Gator Nursery. See our smallest gator friends and learn how our gator family continues to grow. There is so much to discover and explore in this exciting new area. We can’t wait to see you sooner than later… alligator! Get ready for an all new adventure in 2019!